Is a Medicaid Turnabout Coming to the Deep South? An election in Louisiana and a surprising recommendation from an Alabama task force are the latest cracks in red-state resistance to insuring the poor. Gerald Dial, a Republican state senator from Alabama, expressed something of an unlikely opinion last week. “Somebody is going to have to pay some more taxes,” Dial said, so that Alabama can boost health insurance coverage for the poor. Alabama is one of 20 states that have refused to accept federal money to expand their Medicaid programs through the Affordable Care Act. 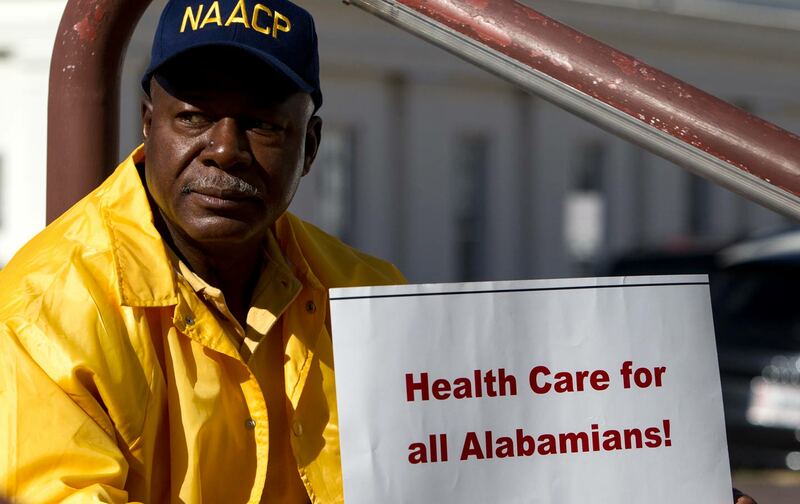 That’s left more than 3 million people across the country, including at least 185,000 Alabamans, stranded in a coverage gap—not poor enough to qualify for Medicaid, but too poor to afford insurance on their own. A disproportionate number of those are people of color, and they’re concentrated in Southern states. But in a few parts of the Deep South, ideological pettiness is starting to give way to practical considerations. Dial’s comments came at the final meeting of a task force appointed by Governor Robert Bentley to study the state’s health challenges, which, to put it mildly, are daunting. Alabama ranks near the bottom of the country in rates of diabetes, sexually transmitted infections, infant mortality, and premature death. More than 13 percent of the population is uninsured, in part because the state has a stringent limit for Medicaid eligibility: parents making over 18 percent of the poverty level, or $3,616 for a family of three, don’t qualify. Bentley’s task force concluded that that the “most serious obstacle” to addressing all of those problems is the “coverage gap that makes health insurance inaccessible to hundreds of thousands of Alabamians.” The panel voted, with no opposition, to recommend an “Alabama-driven solution” for expanding Medicaid. (A handful of states, including Arkansas, have developed state-specific alternatives for the expansion.) Doing so would extend insurance coverage to about 290,000 people, including 185,000 working Alabamans, the task force said. It would also pump $1.7 billion into the state’s health infrastructure, and another $1.2 billion throughout the local economy. The tax revenues should offset the state’s share of the cost, which peaks at 10 percent in 2020. The other bright spot is Louisiana, where Democratic State Representative John Bel Edwards trounced Republican David Vitter in the governor’s race Saturday. Edwards immediately promised that expanding Medicaid will be “among the highest priorities” of his administration. The state legislature passed a financing plan earlier this year that should allow him to do so. That would take more than 220,000 Louisianans off the list of the needlessly uninsured. None of this is to say that red states are suddenly embracing Obamacare. Rather, it indicates grudging recognition that it makes very little sense to snub billions of federal dollars while heaping the burden of caring for the uninsured on state health systems. Republican leadership in many states still opposes the expansion, but they’re under increasing pressure to act. In Georgia, the impending collapse of rural hospitals has prompted the state’s Chamber of Commerce to look for a “Georgia-specific solution” to close the coverage gap. The Chamber in Wichita, Kansas, voted last week to make expansion one of its legislative priorities, albeit with onerous conditions. South Dakota is reportedly “close” to an expansion deal. And in Kentucky, governor-elect Matt Bevin is backing off his campaign pledge to eliminate Medicaid for nearly 400,000 people, and is instead talking vaguely about making alterations to the program. “You can’t be from rural Alabama like I am and not support expanding the Affordable Care Act,” Gerald Dial explained after the task force’s vote. That hasn’t really been the case up to now. But slowly, things are changing.